Adelaide deck - what timber should you choose? What wood would you use for your Adelaide deck? 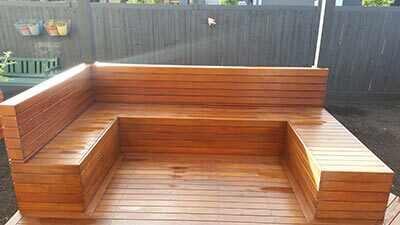 If you live in Adelaide and your building a new timber deck or replacing the timbers on your old Adelaide deck, there are a myriad of decking timbers to choose from. So how do you make the right choice for your situation? If you live in a bush environment surrounded by eucalypts, then using a eucalyptus decking timber such as Spotted Gum or Red Gum is a wise choice. While near the seaside, a grey-coloured timber often looks right at home. Another really good tip is to take a look at any timber flooring you have inside. It might not always be possible to use the same timber, because it might not be suitable for outside use, but a timber that will match the colour will work a treat. It’s not just the look you need to consider. Make sure you choose a decking timber that is suitable for outdoor use and strong and durable enough for the job. Budget also needs to be taken into account. A pine Adelaide deck is economical and can be an excellent choice for a timber deck. If you’re environmentally minded, look for timbers that are sustainably certified. It’s best to also choose a timber that’s local to your area, to reduce pollution and resources required for transport.